The castle of Estremoz is the result of the restoration of the magnificent Palace that King D. Diniz built for his wife, Queen Santa Isabel. The high quality of building materials used, has been completed with the finest decor including museum pieces. From the private palace gardens and swimming pool surrounded by battlements, you have the most superb view over the city of Estremoz and the vast Alentejo plain. In 1259, D. Afonso III recognized the geostrategical location of Estremoz, granted it a charter in Santarém and the castle was founded. 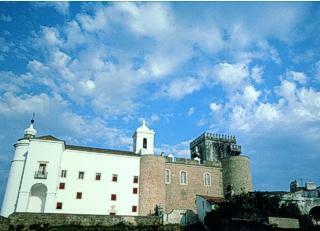 From the beginning, the castle has been associated with the Tower, thought to be the work of three kings - D. Afonso IV, D. Pedro and D. Fernando. This is the origin of the traditional name - Tower of the Three Crowns - symbolized by the marble pinnacle in the East corner of the upper terrace. A few years later, D. Dinis ordered the building of his residence here. Around 1281, he sent ambassadors to Aragon to ask for the hand of the Infanta D. Isabel, later Queen and Saint. 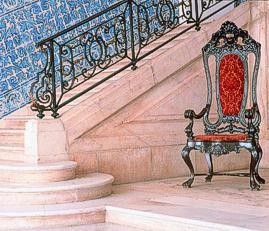 At the end of June 1336, striving for peace and harmony in the kingdom, Isabel came to Estremoz. Tired after two long journeys - from Compostela to Coimbra and from there to Estremoz - by the weight of her years and the sultry hot weather, she fell seriously ill. Despite the care of her son and daughter-in-law, the knowledge of her physicians and the devotion of the Franciscan monks, the illness did not let up and she died on the 4th of July. 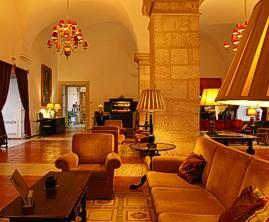 From her stays in Estremoz, several legends were made and miracles are still said to have happened. These still exists and is now a tradition of seven centuries. The most outstanding one is that of the little birds which took her ball of thread in their beaks once when it fell down while she was embroidering. From her rooms in the castle, she also used to attend mass in the low square of the Monastery of Saint Francisco. The palace and the castle themselves mirrored the anguish, uneasiness and despair of her last five days of life in this world. Shortly after came the heart-breaking sorrow and pomp of her funeral, which took place a few days later, according to her will. A few years, later her son left Estremoz for the glorious battle of Salado, which put an end to Arab power in the Peninsula, returning here afterwards. As a testimony, there is a Coat of Arms hanging over the portal of the Audience Palace. 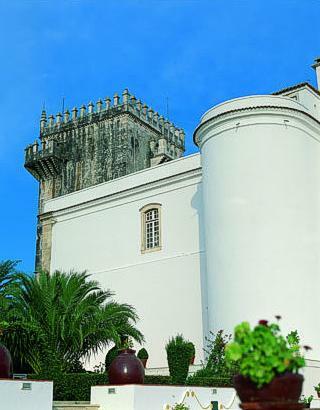 The Saint Queen's grandson, D. Pedro, the lover of the beautiful Inês, also chose this quiet palace in the time of his sorrow. According to the tradition, he was offering his heart to this place, when he suddenly died. 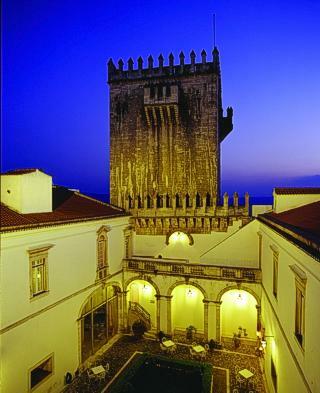 D. Fernando and D. Leonor Teles chose the Palace of Estremoz as a safe hiding place for Count Andeiro, who was politically involved with Castile and England. Tradition says that it was in one of the chambers of the Tower that they started their affair, while the king was having his siesta. Leonor Teles also visited Estremoz when her daughter D.Beatriz married D.João I, King of Castile. Sometime later, this historical place was related to the crisis of 1383-85, which divided the people and the nobles. Mestre de Avis and D. Nuno Álvares Pereira met in Estremoz to try to solve the problem of this crisis. Around 1430, D. João I assembled the Court. In the same period, D. Duarte met D. Gomes, Abbot of Florence, who brought him the bull for the Crusade against the Arabs. In December 1474, D. Afonso IV assembled the Court in Estremoz to consider the delicate matter of the will of King Henry IV of Castile, in which his niece Princess D. Joana was involved. On December 23rd 1490, D. Isabel met her father-in-law and her fiance in Estremoz. Having been first carried out by proxy in Seville, the ceremony was repeated at Santa Maria do Castelo. This brought new life to the palace with nobles and clergymen. Tradition tells this was the first time men and women danced together at the Court. In 1487, D. Manuel came here once more, this time to meet Vasco da Gama and give him command of the fleet which would take him to India. The ladies of Estremoz embroidered the banner under which Vasco da Gama took a oath. In 1659, D. Luísa de Gusmão ordered the creation of the Oratory in the Palace of Estremoz, at the place where the Saint Queen died. During the first two weeks of June 1663, the Palace collected the spoils taken at the battle of Ameixial and in 1665 those of the battle of Montes Claros. On August 17th 1698, there was an explosion in the weapon and ammunition storehouse and the fire destroyed the medieval building, as well as its valuable furniture. The castle was also ruined, except for the Tower. Between 1738 and 1742, D. João had a beautiful weapon hall erected on the ruins, with a collection of forty thousand weapons. Its architect was António Carlos Reis. Those weapons were partially used in 1762 and 1801 and in 1808 the French Army, led by Kellerman, sacked the building and blew it up by setting powder barrels on fire. Nevertheless, they did not manage to destroy it and this was attributed to a miracle of the Saint Queen. In 1833, on July 27th, over thirty members of the Liberal Party were murdered here. From then until the 1930's, this building was used to lodge Military Units. In the fifties, the Industrial and Commercial School of Estremoz was housed here. 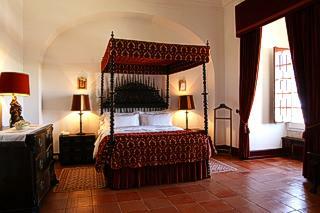 In the sixties, the building, after improvements, became the Pousada Rainha Santa Isabel. 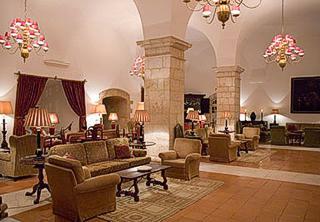 29 Rooms with 18th Century decoration, 1 Royal Suite, 1 Luxurious Double Room and 2 Luxurious Twin Rooms. The bar is located in the D. Vasco da Gama Saloon and is the perfect place to take pleasure of the great view over the city and, at the same time, enjoy the piano music and a drink. The bar has a beautiful esplanade in the interior garden. The restaurant of the Pousada Rainha Santa Isabel, maintains all the amazing characteristics of the 18th century - the century of the lights. 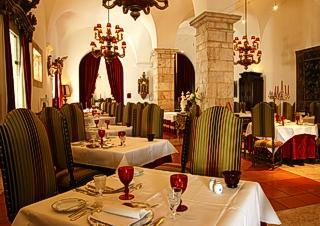 Where, pleasures and flavours of the Royal Table come together to amaze all senses. 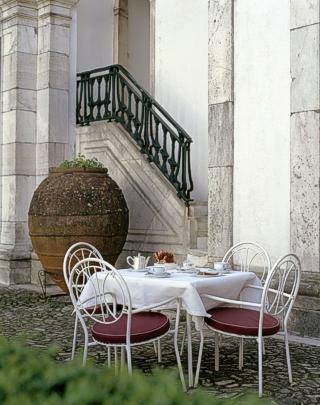 The genially Portuguese gastronomy offers authentic sensations and makes fantasies real. 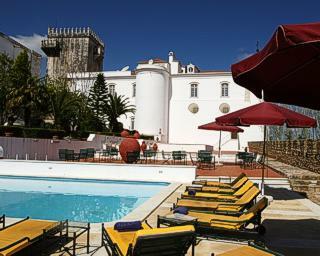 The Royal Palace of Estremoz will appear to your right, circa 182 km from Lisbon, as you proceed on the EN4 road to Spain.